Ryan Bowden joined Moore Ingram Johnson & Steele, LLP in October of 2015 as an associate in the firm’s estate planning and taxation division with a focus on captive insurance formations and management. Ryan’s dad was a college football coach so he has lived all over the southeast but he spent the majority of his time in Auburn, AL and Clemson, SC. He received an undergraduate degree from Clemson University in business and his law degree from Regent University School of Law. 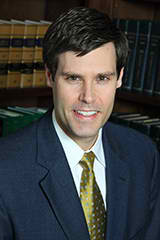 Ryan was admitted to the State Bar of Georgia in November 2007. Afterwards he practiced law at a firm in Vinings focused on transactional law and estate planning but was also a multi- family office. Ryan also serves on the administrative board of Peachtree Road United Methodist and also leads a men’s Christian Leadership Group (CLC) . Outside of the office he enjoys visits to Santa Rosa Beach as often as possible, reading, running, watching football, and trying new restaurants. He resides in West Buckhead with his wife, son, and American Bulldog.